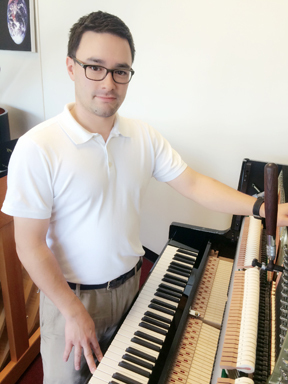 Robert’s Piano Service, established in 2005, is locally owned, insured and licensed by Robert Hirohara, expert piano tuner/technician. Robert has passed a series of rigorous exams verifying skills in tuning, regulation, and repair. Robert trained in piano technology at San Jose State University in San Jose, California. Robert’s training and experience has been enhanced by his participation in the local chapter of the Piano Technician’s Guild and the continuing education available through it as well as the Guild’s regional and national conventions. Robert has been a member of the PTG for over 5 years. When Robert is not working on pianos, he enjoys listening to, and composing music.